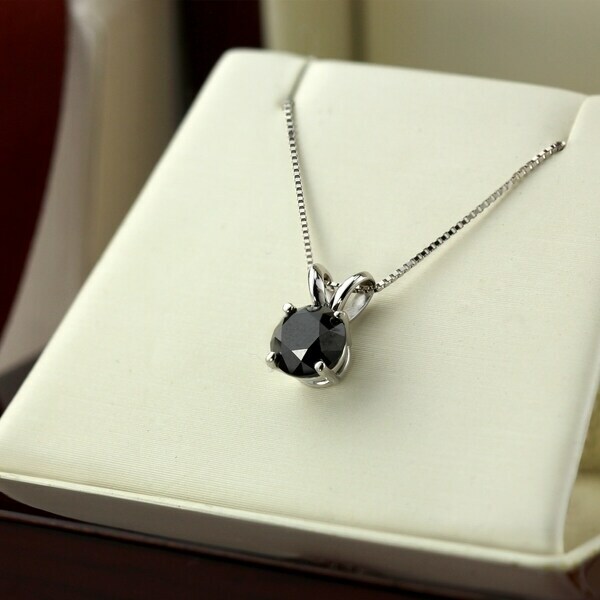 Divina Sterling Silver 2ct TDW Black Diamond Solitaire Pendant. Black Diamond Solitaire Pendant by Auriya showcases an enchanting 1.00 carat black round diamond, suspended from an adjustable 16 to 18-inch box chain that dazzles in alluring yet fierce simplicity. Black diamonds are the perfect non-traditional bold statement. Versatile and elegant with a flair of mystery, this black diamond necklace is crafted in your choice of 14k Yellow Gold, White Gold or Rose Gold that shines bright with a high-polish finish. Treatment code G (Gamma) for main stone. See Treatment Guide for all treatment code information. I love black diamonds and this necklace fits perfectly with my other black diamond jewelry! Ordered in white gold and the finish is beautiful. Best of all, the delivery was very fast. This black diamond is gorgeous! It shines and sparkles just like a white diamond. I love it and wear it often with my black diamond earrings. Very classy and smart looking! Pretty black diamond solitaire and lovely rose gold chain. Thank you Seller. Excellent quality! Fast delivery! The solitaire in the white gold setting is quite striking. This was one of my favorite purchases. I just wished it had a solid chain to go with the pendant. If so it would have received five stars!!! Girlfriend and her friends loved it.